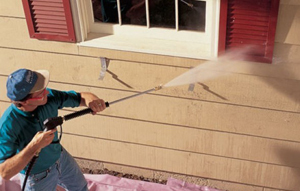 When a buildings exterior begins to dull and fade over time a pressure washing will reinvigorate your buildings overall appearance and luster. Customers, buyers and other visitors will find your building more impressive than ever before. The surface of your exterior makes no difference, whether it’s wood, stucco, or concrete our trained experts have the experience of adjusting the water pressure with extreme precision to ensure the structural integrity of your building. If your problem is unsightly gunk and grime we have the option of a Hot Pressure washing which will effectively erase one hundred percent of all dirt and stains you don’t want to deal with.